We were extremely pleased to get such an enthusiastic review for one of our Daily Drinker red wines. We select wines for our sampling club with extreme care and take pride in each and every one of those selections...so praise in the national prose is entirely welcome. That's the good news. 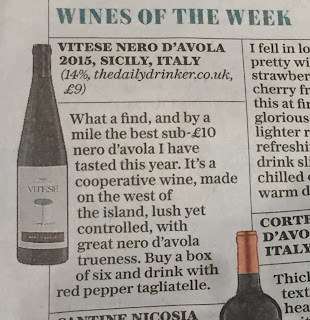 The bad news was that Victoria Moore's email announcing our coverage came with an apology: it had taken her five months to find a slot for this majestic Mediterranean red and the consequences of that are twofold. Firstly, we are very low on stock; do not, in fact, have sufficient to cover all orders generated by Victoria's article. Secondly, the UK importer of the wines of Colomba Bianca has moved on to the 2016 vintage. What to do?!? Well, the importer has whisked along a bottle of the 2016 and I have, today, popped the cork and had a look. And to be frank the '16 is at least as good as the '15. Younger, of course. And there's no hurry to drink up (indeed, I suspect it'll be better yet in a month or two). But thoroughly delicious, just like its antecedent. And still offering the most amazing value. If you'd like to find out what all the fuss is about, you'd be welcome to order this wine. Minimum order is 6 bottles, for which you'll pay a £7.50 delivery charge. Order 12 bottles (which may be mixed with other Daily Drinker wines) and delivery is free.